Why, yes, now I am two days behind with Reading For Research Month. And I didn't do a done-list post yesterday. And I'm way behind on the April Connecticut Children's Literature Calendar. And I didn't work at all during the day yesterday, because I spent five hours painting walls. Whimper. Wail. But that last thing, I'm getting a blog post on. Yes, I will find a way to work painting my entry into this blog. In the meantime, she went on with a sigh, on Thursday, Cindy Schrauben told us about interactive books. These are narratives that children get pulled into in some way, beyond the traditional entering the world of a story. It makes a book a different reading experience. Fortunately, I was able to get hold of four of these fun books. 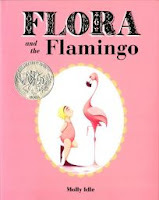 Flora and the Flamingo by Molly Idle is a wordless book that requires readers to interpret what's going on. In case they don't get the point that they they have a part in this, there are several pages that have sections that need to be opened to expose what's under them. 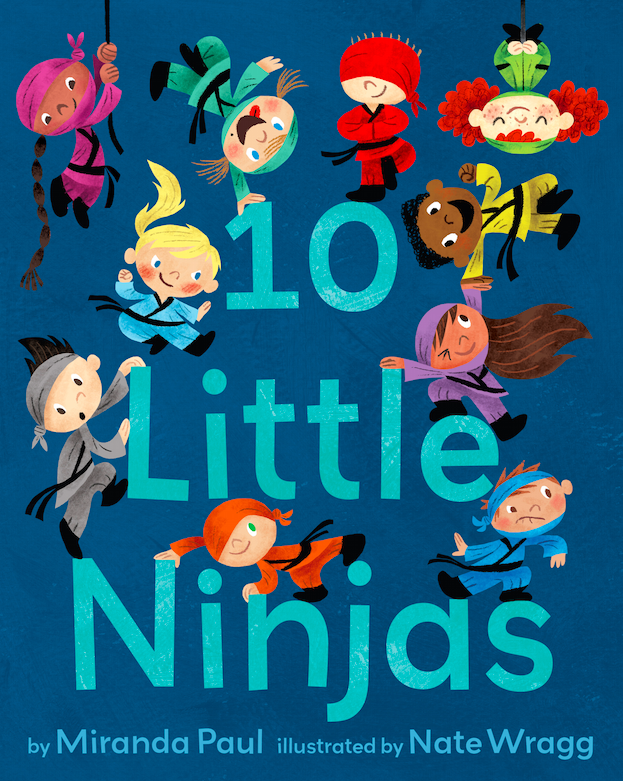 10 Little Ninjas by Miranda Paul with illustrations by Nate Wragg is an example of an often repeated format described on Day 15 of ReFoReMo. The repetition of the classic Ten Little Monkeys story catches readers'/listeners' attention. 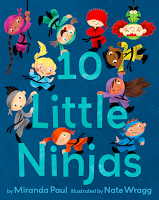 But the writer and illustrator of 10 Little Ninjas bring a feminist twist to their version. Maybe I'm just reading that into it. Nonetheless, I may be getting this for a very young female family member. 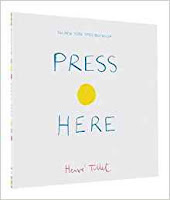 Press Here by Herve Tullet is unique in that it actually instructs readers to do certain things to it. We're not talking a real narrative here. It's more playtime between reader and book. 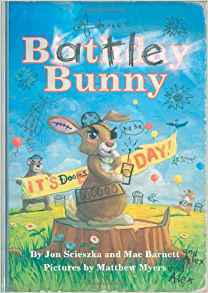 And Battle Bunny by Jon Scieszka and Mac Barnett with illustrations by Matthew Myers is just brilliant. The premise here is that we're reading a precious bunny book that another reader interacted with by rewriting the text and altering illustrations. This is, hands down, my favorite Jon Scieszka book. When I finished it, I thought, This would be a neat...mentor book!...for a class project. Get kids into revising a book of their own. Well, the folks behind Battle Bunny are one step...probably several steps...ahead of me. You can download the "original" Birthday Bunny pages that "Alex" revised to suit himself so that your young ones can do the same. A great Easter present for an older child. Or maybe an adult. 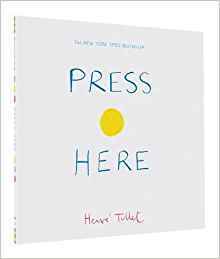 Can I use this idea of providing interaction for child readers in my picture book manuscript? This is something I would like to try. It's going to take some thinking. ReFoReMo Books Read To Date: 40 I broke the 4 O! Will I make 50?